Offering generous room for both cargo and passengers, bold styling, capable performance, and a confident driving position — SUVs and crossovers have continued to grow in popularity for a variety of reasons. You’ll have your choice of 6 different crossovers and SUVs found in the Toyota model lineup. If you’re having trouble deciding which model is the best option for your lifestyle, family, or budget — Germain Toyota of Columbus is here to help. We’ve taken the time to compare each vehicle side-by-side and provide you with key information to help you choose the right SUV or crossover. While the city-sized footprint of the Toyota C-HR is perfect for small spaces and narrow streets, it’s also big on style and attitude. Its driver-focused cockpit offers seating for five passengers in addition to an array of advanced tech features including standard Entune™ 3.0 Audio with App Suite. You’ll enjoy economical yet responsive performance from a 144-horsepower 2.0-Liter 4-Cylinder Engine paired with a Continuously Variable Transmission with intelligence and Shift Mode (CVTi-S). The C-HR is available in a variety of bold, expressive exterior colors including optional R-Code two-tone paint treatment to help reflect a personality as unique as your own. 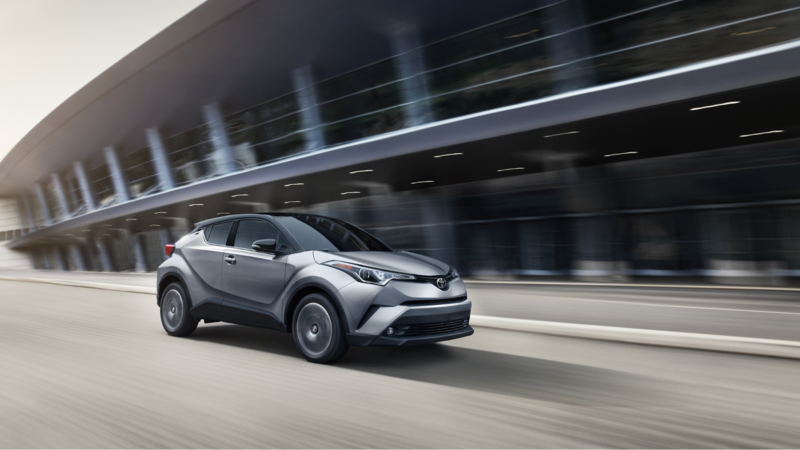 Thanks to standard Toyota Safety Sense™ P (TSS-P), you’ll have additional confidence and peace of mind behind the wheel of the Toyota C-HR. All-new for 2019, the next-generation Toyota RAV4 delivers rugged good looks and capabilities which reveal the potential of where you can go, on- or off-road. Not only is the RAV4 Toyota’s best-selling vehicle in the U.S., it’s also the best-selling non-pickup truck in the country. Thanks to a new Dynamic Force 2.5-liter inline-four-cylinder engine paired with an 8-speed Direct-Shift Automatic Transmission — the all-new RAV4 makes a leap in both power and efficiency. 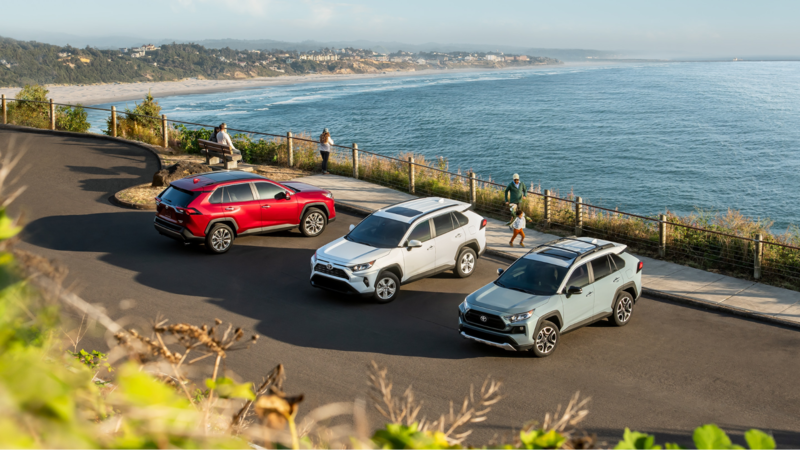 Sharper on-road handling and an even more accommodating and quieter ride than its esteemed predecessor prove that the 2019 RAV4 is ready for whatever task is on your agenda. Upscale interior amenities include available SofTex®-trimmed seating surfaces, a heated steering wheel, and a Premium JBL® Audio System. Stylish, capable, and fuel efficient — the Toyota RAV4 continues to be a hit with drivers across the country. Perfect for growing families, the eye-catching Toyota Highlander offers spacious seating for up to 8 passengers. An available 3.5-liter V6, 8-Speed Direct Shift Automatic Transmission, and Dynamic Torque-Control AWD system provide drivers with plenty of capability including a maximum towing capacity of up to 5,000 pounds. The optional Rear-seat Blu-ray Disc™ entertainment system and second-row captain’s chairs help eliminate boredom and discomfort on extended road trips. Perfect for communicating with the little ones in the back seat, available Driver Easy Speak allows drivers to keep their eyes focused safely on the road ahead. 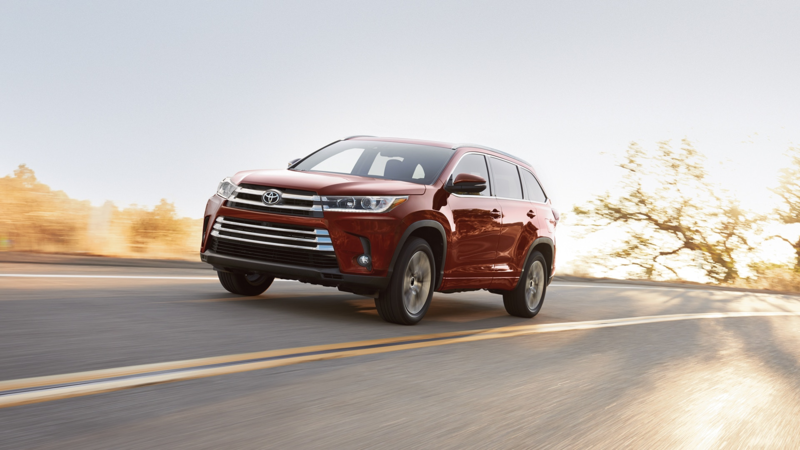 Experience confidence and reassurance behind the wheel of the Highlander with standard Toyota Safety Sense™ P. Available in five distinct trim levels, there’s sure to be a Highlander model which perfectly suits your lifestyle. Rugged styling, impressive off-road performance, and innovative tech features help make the Toyota 4Runner the perfect companion for exploring what’s off the beaten path. 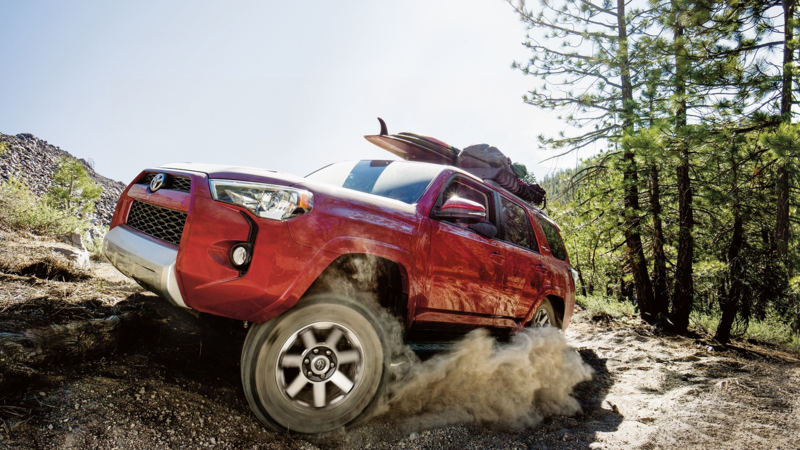 Its proven 270-horsepower 4.0-Liter V6, body-on-frame construction, and advanced terrain-conquering technologies give the 4Runner plenty of muscle when you need it most. Inside, you’ll enjoy the perfect space to relax on your way to the trails. Perforated leather-trimmed heated and ventilated front seats, power tilt/slide moonroof with sunshade, and a Smart Key System with Push Button Start add even more refinement. Perfect for those living active, adventurous lifestyles, the 4Runner can tow up to 5,000 pounds and features an innovative power rear glass window for easy access to your gear. 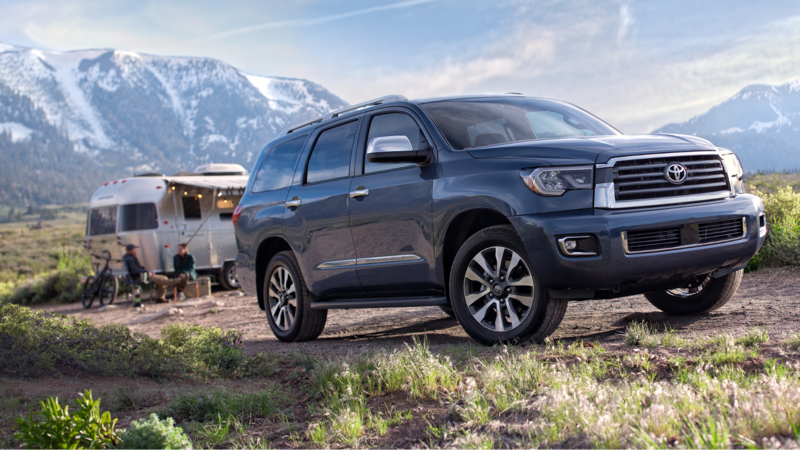 Powerful, commanding, and big enough for the whole family — the Toyota Sequoia offers plenty of muscle thanks to its standard 5.7-Liter V8 which produces 381 horsepower. You’ll have the ability to tow up to a massive 7,400 pounds, perfect for a camping trailer or boat. With three-row seating for up to 8 passengers, the entire team has plenty of room for the trip across town to soccer practice. Smart tech features available on the Sequoia such as a Power Reclining and Fold-Flat Third-Row Seat, rear-seat Blu-ray Disc™ player, and automatic power liftgate add convenience to improve every drive. Offering 120 cubic feet of cargo capacity, you’ll be able to pack all of your gear to help make memories on your next weekend vacation. 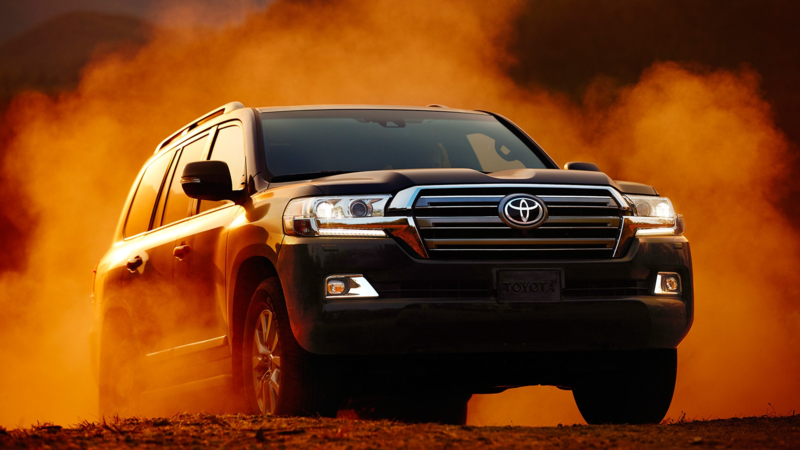 Built on a 60-year heritage of conquering some of the most inhospitable environments across the globe, the Toyota Land Cruiser has earned a reputation for unrivaled off-road capability combined with superlative luxury. Standard features like Crawl Control (CRAWL) with Off-road Turn Assist (OTA), Multi-terrain Select and the Kinetic Dynamic Suspension System (KDSS) not only ensure that you’ll reach your destination — but also that you’ll make it back home. Offering the perfect escape for when Mother Nature decides not to cooperate, the interior of the Land Cruiser offers spacious seating for up to 8 passengers. Amenities found inside the cabin include perforated leather seating surfaces with front and rear multi-stage heating, a 9-inch full-color touch-screen display, and Premium JBL® Audio with Integrated Navigation and Entune® App Suite.